Donegal is like one of those boys your mother always warned you about.. moody and unreliable, glorious one moment, dumping on you the next, but always, irrisistable. It’s the same as it always was. I came here every year as a child, so many memories merged into one mish mash of feeling and nostaligia. I can close my eyes and see the rugged mountains and coastline, taste the chicken maryland we had as a treat every holiday in the Nesbit Arms Hotel, smell the turf, hear the silly names my brother and I gave all the funny sounding Irish places. But mostly I remember my mum’s white tupperware box, always full of her fudge squares and caramel squares she had made the night before we left. The glorious days on the beaches, the long walks as my dad dragged us over ‘just one more hill’, the interminable days inside the smokey cottage as the rain lashed outside. Donegal has a personality complex. When the weather is clear, the horizon is further than anywhere I’ve ever been in the world. The sky seems endless, life is limitless. But when the dark clouds brood and close in, spewing torrents of ‘wet rain’ like sheets of water, the sea mist creeps around until there is nothing in your vision at all – just you, your house and if you’re lucky, the end of your path. No sky. No mountains. No road. Donegal can make you feel tall and small in one day. The smell of turf burning takes me back 30 years in an instant to my family sitting round the fire, life at it’s most basic, the rain thrashing the windows as the clump of the tupperware lid opened and our family hands tangled in desperation as we grasped mum’s chocolate treats. And so here I am again. I am the mum now. The schizophrenic weather has us changing clothes three times a day. Last week I burned in the sun, the beach so vast, skies so wide it felt unwordly. And today, rain is so dense, the weather so close, we can’t see past the wall. My mum and dad were meant to be with us this week, and I know without a doubt, that if she had been able to come, the tupperware box would have been on her knee as the car drove up. So, with a heavy heart, and a happy memory, I opened up her recipes, and I made her fudge squares. My girls now love them as I once did, and so it continues. My mum will never share a holiday with us again, but we sit in the turf-smoked room, the rain dancing furiously outside, and the clip of my new tin opens, and our family hands tangle as we reach for my mum’s chocolate treats. Like Donegal weather, life is unpredictable. You never know what’s around the corner. But like Donegal, it is the things that stay the same that keep life going. I miss you mum. But I’m creating new memories in your shadow. Memories I hope my girls will take through their lives as mine still take me. 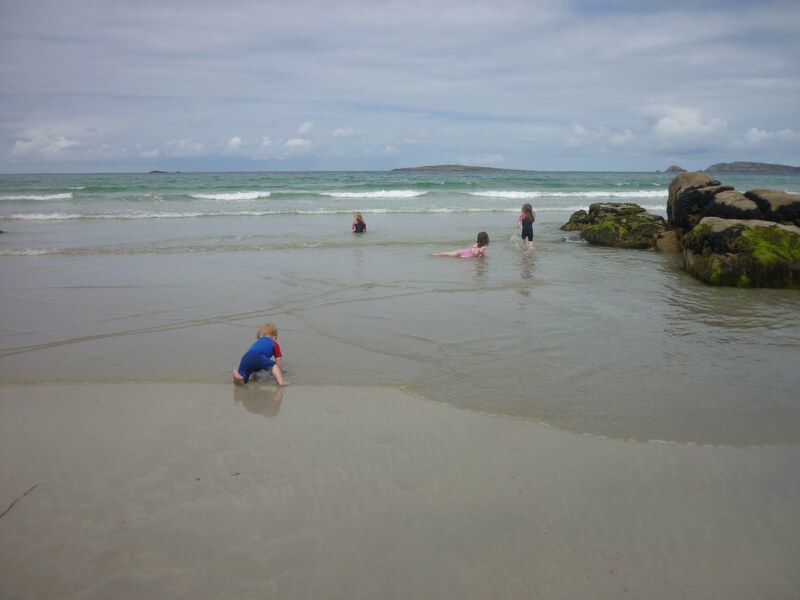 This entry was posted in Donegal, memories, mum. Bookmark the permalink. hmmm, sounds like old summers in Maine but with fresh picked blueberry buckle instead of caramel squares. it's wonderful you can keep this memory going through generations.